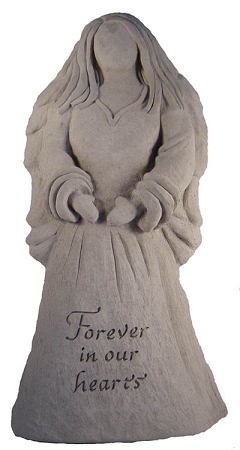 Home > Outdoor Living > Garden Accents > Angel Statue - Forever In Our Hearts..
Our Angel Statue is both beautiful and unique. The Angel adds a perfect three dimensional touch to any garden. The Angel is made of cast stone that creates a unique texture that makes it feel as if the stone was chiseled by hand. The Angel is weatherproof and guaranteed to last a lifetime. Made in the USA.